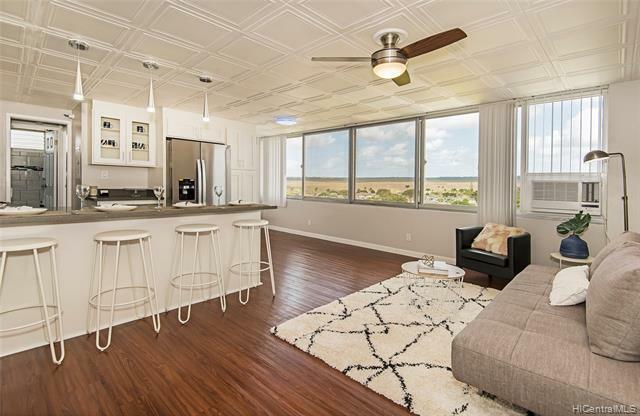 COMPLETELY RENOVATED beautiful fee simple condo with stunning views! Corner unit, light & bright. ALL NEW - custom kitchen with QUARTZ counter tops, new cabinets, stainless steal appliances, modern bathroom, closet organizer in master closet, washer/dryer, top-of-the-line Friedrich A/C unit (drip-free), vinyl plank flooring, interior fire sprinklers & hard wired smoke detector for added safety. Covered assigned parking stall w/gated entry & lots of guest parking. HOA fee includes hot water so LOW electric bills!! Century Park Plaza\'s great amenities include 24/7 security, pool, jacuzzi, BBQ area, basketball & tennis courts & playground. Conveniently located near freeway access, Pearl Highlands Shopping center, Walmart, Sam\'s Club, 24-hour fitness, etc. OPEN HOUSE 2/17 from 1-5pm. Enjoy!